Synthetic Hemp also known as Hempex, Polyhemp and Hardy hemp. With its accurate diameter sizes and the fact it does not rot. This rope is ideal for outside projects. 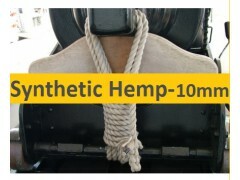 With it's natural appearance but qualities of a synthetic rope a very popular choice with landscape garden designers.